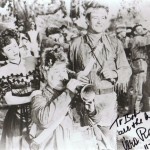 Exactly one year from today, the second and final day of Sons pre-convention tours will leave bright and early from the Loews Hollywood Hotel for our tribute to Oliver Hardy’s good friend and one time co-star, John Wayne! The day will include a two-hour tour of Newport Bay aboard John Wayne’s former yacht, The Wild Goose. Originally the USS YMS-328 was a Navy yard mine sweeper during WWII. John Wayne purchased it in 1962 and enjoyed sailing on it with friends and family until his death. Beverages and light hors d’oeuvres will be included. 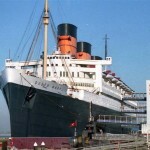 The next stop will be the HMS Queen Mary in Long Beach where a lunch buffet will be enjoyed by all in the very same dining room the boys used during their trip to England. There will be time for you to explore this grand old dame of the sea on your own as she has such a rich history. Countless movies and television shows have been filmed there most notably The Poseidon Adventure. Final prices have not been set yet by the bus company or the Queen Mary, but I would estimate this day-long tour will cost $149. Also, be advised this trip is limited to 100 delegates due to the size of The Wild Goose. All convention events still are in the planning stages and some contracts have not be finalized, thus the order of events may be changed or moved to another day or omitted. At this point, I am 90 percent sure these events will come off as planned.